David Miller Architects is a small practice based in central London. Our work load is fairly typical of a small practice being affordable housing, schools, student housing and some mixed use commercial work, mainly budget hotels. As more than three quarters of architects work in offices of fewer than 10 people we believe our sector needs to engage in the BIM debate. We therefore propose to describe our recent BIM experience in three parts: firstly describing the adoption process, then defining the costs and concluding by trying to quantify the business advantages. DMA came to BIM through 3D modelling; the practice was already modelling all of its projects and then reverse engineering them into 2D to produce construction drawings. On bespoke one-off projects, of the sort young practices cut their teeth on, this approach worked, but it was inefficient and created a lot of redundant information. 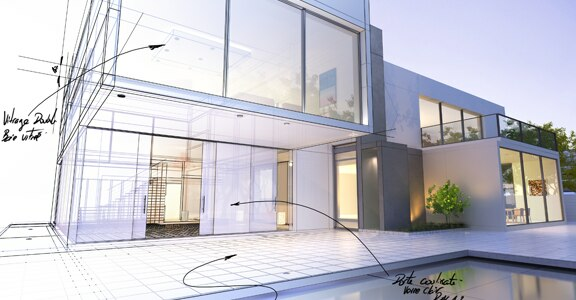 As architects, we are aware that we can add considerable value through the design process. However the time spent communicating our ideas can eat away at that value. So, as the practice started to mature, and we began to target more commercial work with more challenging briefs, we realised that we needed tools that would make us more efficient. What initially attracted us to using BIM tools was the opportunity to develop a project in a single environment without the waste created by our previous workflow. We also hoped that the embedded quality control and co-ordination of the software would add a consistency and a confidence to our output. This is important for a young practice in order to be taken seriously, especially when employing very talented, but comparatively inexperienced staff at the beginning of their careers. We have come to realise that small organisations like us have got it easy when it comes to change-management. While the cost is often seen as the barrier to entry (it is the same for larger practices, only scaled), it's actually the process change that is the real challenge. Here smaller practices have the upper hand; we don't need to convince the board or investors and it's easy for us to overcome internal resistance from staff with a vested interest in doing things the way they always have. 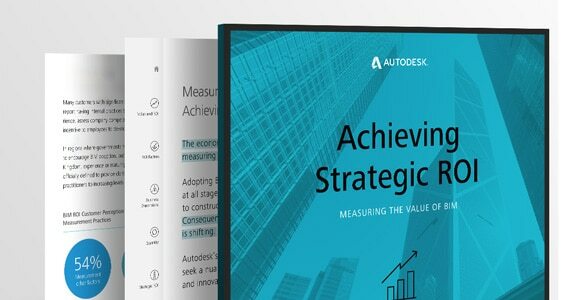 So whether you approach BIM through ROI calculations or you act on instinct and experience, a small practice can simply make the decision buy the tools and get on with it. At DMA the rollout was incremental. 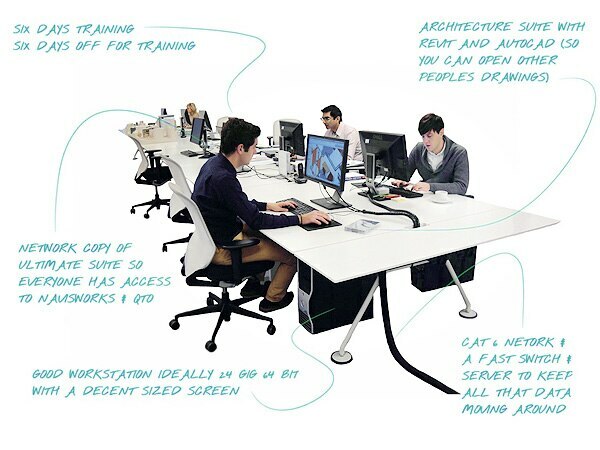 In 2007 all workstations were converted to Autodesk Revit and all subsequent new starters got a Revit work station. However the initial purchase is only the beginning. The office has become steadily more sophisticated over the last four years, with an intensive push over the last two. It would have been a considerable challenge for us to go straight to level two BIM without a few practice runs. At DMA we were lucky to be able to cut our teeth on some smaller projects where if it had gone wrong we could have easily reversed out into 2D CAD. We started with some initial training and went straight into a small £1m residential building, using Revit simply to produce the drawings, with no collaboration. This process was repeated a number of times on increasingly larger projects, making particular effort to coordinate the digital BIM information with the latest NBS update. However, there was still a tendency to fall back into AutoCAD on refurbishment projects and sometimes if under intense time pressure. At the end of 2009 we made an internal commitment to use BIM tools on all projects. To facilitate this we hired an in-house trainer and BIM champion. This upped the game immediately and led to our first collaborative models. Our BIM champion developed an intensive but entertaining six day training schedule broken down into 40 minute modules. This ensured that staff always had time to complete some training. This was then backed up by a BIM 'Boot Camp' for new starters that involves full immersion with no distractions in their first week in the office. This sets the agenda for how the office would like to work. More recently the BIM champion role was blown apart, with individual members of the team taking responsibility to explore different parts of the process and share their experiences in office CPD sessions. This has led to us producing our first Quantity- Take-Offs and a FFE Procurement model (linked to Codebook) for our school projects. 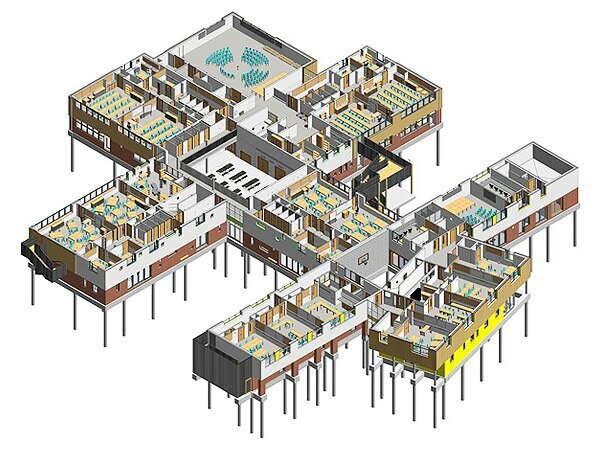 We have also completed an O&M model for a small student housing scheme and drafted our first BIM execution plans. During this recent evolution we have developed an in-house BIM manual and a BIM Plan of Work which defines inputs, processes and outputs for each of the RIBA work stages. A realistic budget for a workstation is around £10,000 once you include hardware, software and training. Even when offset against the cost for a conventional workstation it represents a big investment. DMA have spent £30,000 a year since 2007. However viewed in relation to technical staff costs and fee income, it starts to look a little less scary. We believe that if you have high quality professional staff it makes commercial sense for them to be using the best available tools. What has been the benefit to the business? In the current commercial environment the ability to do more for less has been a considerable advantage. Being able to offer additional services outside our traditional scope has helped to differentiate us in a difficult market particularly with services like Quantity-Take-Off. We are also confident that the consistency in our output is generating repeat business, not least because we have been able to drive efficiencies from project to project as our database of standard components has become richer. Most exiting is that the new process is encouraging collaboration at a micro and a macro level, refocusing the team on the end product rather than just on project trackers and compliance reports. The virtual building is on the team's workstation monitors and the office projector screens constantly, reminding everyone what we are working towards. The quality controlled output has undoubtedly given our team confidence while the tools have reduced the drudgery of production of information, enabling staff to punch above their weight, which has improved team morale and motivation. We are also seeing unpredicted advantages in areas such as stakeholder consultation; users are seeing exactly what they are going to get, and this is useful in managing their expectations early on in the design development. As a further bonus, our new workflow has simplified our internal design management and allowed us to build our office process around BIM. This has impacted on our external accreditations, ISO 9001 / 14001 and Investors in People, which have all benefited positively from our BIM workflow. In a recent review of fee income against technical costs, the impact on the business has become clear. Early on, as we were learning the tools, our costs and income remained fairly parallel. However, once we became more experienced and made the full commitment to BIM, our costs have flattened out and our fee income has continued to rise. By reviewing cumulative construction values we can see the potential impact that this is having on the business. Not only has the office grown from four to 14 people in the last three, years but the size of the projects that we are working on has increased considerably. Whilst some of this growth can be attributed to a young office growing, we believe the quality and quantity of the output due to BIM has had a contribution, particularly to our repeat clients who represent the majority of our workload. Mohle Design principal Geoffrey Tears plans to leave a design legacy based on parametric design – and building information modeling will make help him do it. In this inspirational article, read about what influences Geoffrey Tears’ designs, how he keeps the creative juices flowing, and how BIM has helped him unlock new ways of working. You know you need to make the move to BIM at some point, but you’re reluctant. But did you realize you’re already half way there? 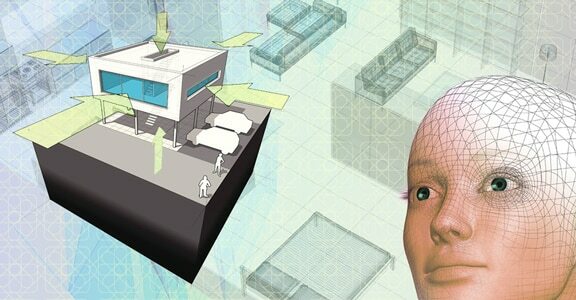 The processes you already use to create and design are BIM-ready, and so are you. But if you’re not convinced, this article details five good reasons why you’re already prepared to implement BIM into your working processes. 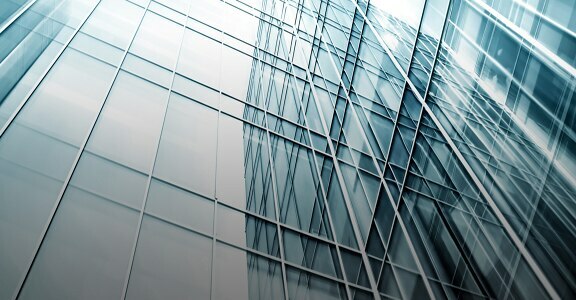 Learn how one small firm managed the costs of BIM adoption and is now realizing positive ROI. Read on about how David Miller’s firm successfully switched over to BIM without compromising on services or quality.